When Pantone announced the color of the year for 2019 which is Living coral, we were so excited since it would be totally perfect not just for events but for weddings as well! And if you were mesmerized with the color like us, we’re giving you some inspirations on how you can rock the Living Coral for your events, wedding, and tablescapes. The Living Coral is a coral shade with bright characteristics and could sometimes be seen as having some pink attributes and other hues. This is perfect especially for those pink and bright color lovers who wants to try something new and fun! 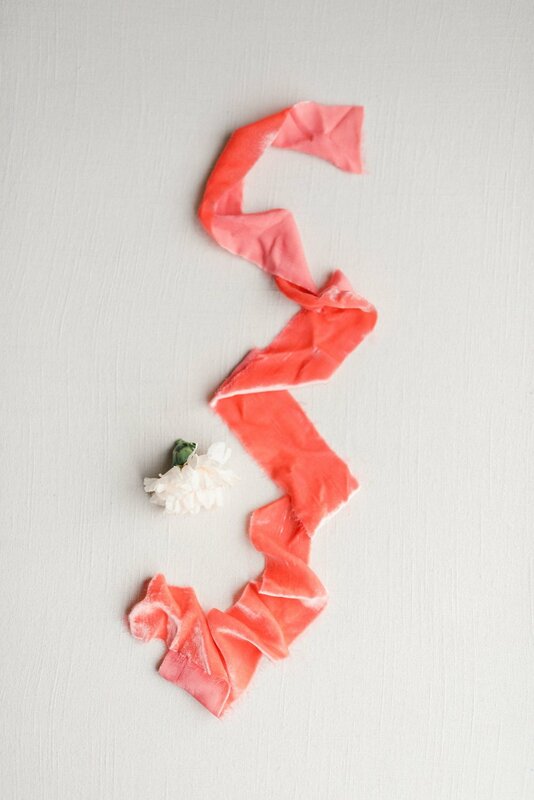 Make amazing flatlays with a living coral silk velvet ribbon! These will result in lively photos that comes along with soft and romantic vibes as well. It will also be great for designing stationery, bridal bouquet, and just overall event design. These ribbons could be the pop of color needed to bring out the gorgeous event reception theme that you have chosen. It’s also a great idea to use as silk table runners for a fun, soft, and feminine tablescape! There are definitely no rules in design so you’re free to use even lighter or darker shades of the Living Coral. For our silk table runners, it is best paired with white tables, minimalist tableware, and some peony soft pink flower arrangements. White and Living Coral is a great combination. It gives a minimalist feel with a bright touch of color which is very pleasing to the eye. It’s a great inspiration for cake designs like this one. To make everything look like the pinterest or tumblr cake aesthetic of your dreams, a transparent cake stand is all you need for all the designs to come together. Living Coral is such a great color for 2019 and we can’t wait for all the weddings and events that will use this color! Would you love Living Coral as a color theme for your event or wedding? Send us a message and let’s make those goals come to life!